James approached us for a revamp of his company with a new logo, website, business cards and stationery. The brand was tired and needed updating, and his website was unresponsive (not compatible with tablets and smartphones) and not user-friendly. We designed an iconic logo, taking inspiration from elements of the chauffeur’s Mercedes (steering wheel, gear stick, alloys, as well as road maps and the the letter ‘C’ for ‘Cotswold Chauffeur’) to create a recognisable symbol. This not only works as an icon for use on marketing material, but also on social media platforms. 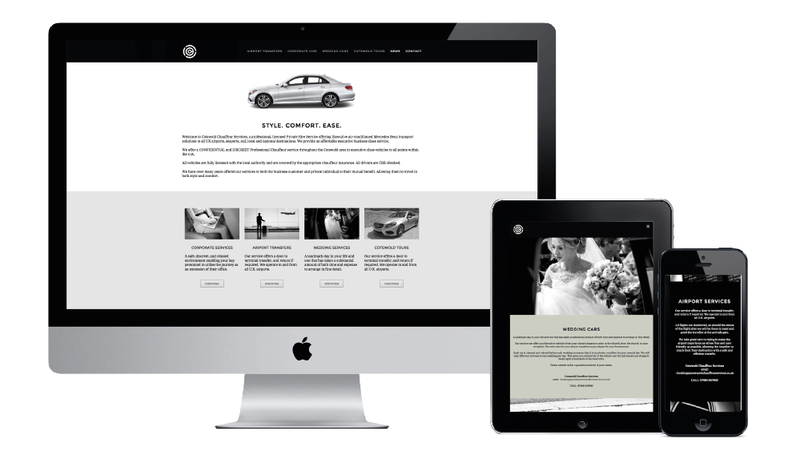 The website is designed on WordPress as a ‘one page site’ – all the relevant information is on the homepage. This is optimised for tablet and mobile viewing, where a “third of all online access is via smartphones.” We took advantage of this by adding parallax elements to the homepage, creating interest between the imagery and copy. Focusing on the ‘high quality’ aspect of the company, we chose a classic black and white colour scheme with warm Cotswold green hues. Striking photography was carefully selected to set the tone of the brand and highlight the different services offered.